● Class content, style are customised to create a personalised learning program for each student. This allows our students to improve their Japanese at a rapid pace. ● Very flexible lessons, times and conditions. ● We organise regular parties in a casual environment to practice the Japanese that the students have learned; a fun way to practice! ● Proficient tests are available for those students that want to be able to accurately track their progress. 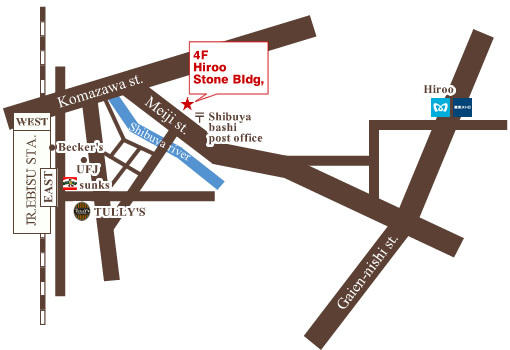 Only four minutes walk from Ebisu Station! Please call to make an appointment to visit us! Just leave a telephone message if we are unavailable and we will get back to you soon. Copyright (C) EBISU Japanese Language School All Rights Reserved.